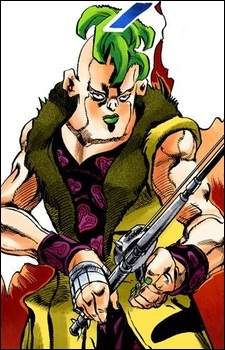 Pesci is a member of La Squadra di Esecuzione. He operates together with Prosciutto, who he refers to as his "big brother" (most likely in the yakuza sense). Although he appears timid, he is actually even more dangerous than Prosciutto, which the heroes eventually find out the hard way. His Stand is named Beach Boy (ビーチ・ボーイ Bīchi Bōi). This Stand takes the form of a fishing rod with a skull-shaped reel. The line can phase through any non-living thing, and sense living things in the immediate vicinity. The lure can also be affixed to a single place to await a victim. When a victim touches that area, Beach Boy will hook them, and begin burrowing into their body, usually aiming for the heart (Beach Boy is sensitive enough that Pesci can tell precisely where in the body the hook is). Any attack on the line itself is reflected back to the attacker.